It’s been three weeks since the last major security breach (Anthem!) so, sadly, we are due. But, when it occurs, are you prepared? Having a secure password is essential to your safety in these situations and so is the ability to quickly change it when a breach happens. A password generator can save you time and stress by helping you create a strong and hard to hack entry code. It’s time to stop using the same password for every online profile you have! Know how to make a safe password so you can protect yourself and lessen the chances of being hacked. Why is it important to have secure passwords? Security breaches happen all the time. Two of the biggest: Heartbleed Bug and Bash Bug/Shellshock affected millions of sites causing users’ passwords to be stolen and as a result, their accounts became vulnerable. In this case, whether you had secure passwords or not, your information was accessible to hackers. These two “bugs” show just how easy it is for someone to obtain your information. 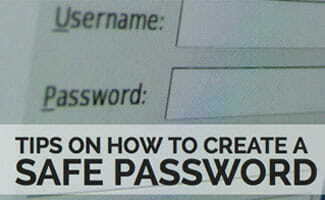 To help avoid being hacked by a cyber criminal, we suggest you create strong secure passwords for all online accounts. When you’re creating passwords you should try to meet certain requirements. Check out this video for some strong password tips to help you be more secure online. Below are some examples of strong passwords. Note: Do not use any of these passwords for your own personal use since they are listed on a public webpage. Notice how these secure passwords have various symbols, letters and numbers. Also, the length of each is more than 8 characters. These are weak passwords that should never be used. If you use a password that is listed below (or similar), we strongly suggest that you change it ASAP. Notice how these passwords are short, form words, include personal information and are easy to guess. These can easily be cracked by hackers. One of the most commonly used password generators is here. You can set the number of characters and the types of characters you want used. Want to know how secure your password is? Many password managers tell you how safe and strong each of your passwords are. This is usually displayed by a scale of red to yellow to green. Red is the ‘danger zone’ i.e., your password is easier to hack and green is the ‘safe zone’ i.e., it will take much longer for it to be hacked by an average computer. Have you ever had a password hacked?